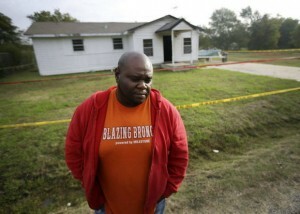 Terrence Walker stands in front of the house of his mother Mary Brownlow in Terrell, Texas. Walker’s brother Charles Everett Brownlow Jr. is accused of killing their mother, and aunt and three other people. Photo courtesy of Associated Press. Mass killings involving four families in four states over four days prompted Associated Press reporter to write an article that tried to explain why such horrendous acts occur. National Association of Social Workers expert and Howard University Professor Tricia Bent-Goodley, and other experts said such crimes are more common than you think. Bent-Goodley is author of the “The Ultimate Betrayal: A Renewed Look at Intimate Partner Violence” (NASW Press, $33.99). Meanwhile, social health scholar and psychotherapist Elena Mustakova-Possardt said one way to lessen the frequency of such crime is to find ways to keep people connected to their family and communities. People who commit such crimes are often socially isolated and have come to hate themselves and their communities, she said. Social workers help clients overcome life’s adversities, including trauma and mental illness. To learn more visit the National Association of Social Workers “Help Starts Here” Mind and Spirit website.